You can't always save a tree from demise, but happy endings begin with you recognizing there's a problem before it's too late. It’s not always easy to spot when a tree is in trouble, but it’s important to keep your eyes open for problems. Here are a few red flags to look out for. Pull ground cover away from the bottom of the tree to get a better view of the trunk. Here, hollow spots or cavities indicate serious problems. So can the presence of mushrooms; these may suggest the presence of rot or decay. While you’re at it, check the ground on the side opposite the lean of the tree. 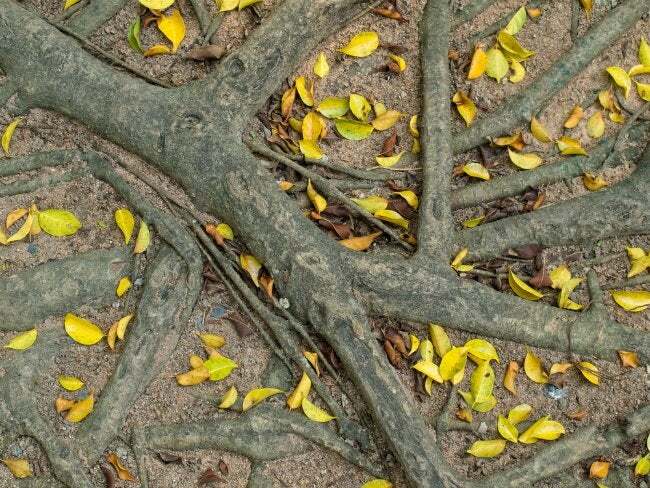 If you see roots protruding, it could mean the tree’s beginning to topple. Another possible hint that the tree may be in trouble: patches of missing bark on the trunk. A long streak of missing bark usually means the tree was hit by lightning, an event that’s often fatal, if not immediately then in the long term. If you’re in doubt about the status of a tree, it’s best to call in a certified arborist. Besides having the knowledge to spot problems, arborists also use specialized tools, which enable them to bore into trees and access more definitive answers about their overall health. Bob Vila Radio is a newly launched daily radio spot carried on more than 60 stations around the country (and growing). You can get your daily dose here, by listening to—or reading—Bob’s 60-second home improvement radio tip of the day.